James Everett Chase, businessman and politician, was born the youngest of seven children in Wharton, Texas in 1914. He attended high school in Ballinger, Texas. During the Great Depression, Chase became an enrollee at a Civilian Conservation Corp (CCC) camp in El Paso. Upon completion of his CCC service, he migrated to Spokane, Washington with fellow Texans, Elmo Dalbert and Harry Blackwell. In 1934, when Chase first arrived in Spokane after hoboing across the west, he found a job shining shoes at a white barbershop. In 1942 Chase married Eleanor Barrow, the granddaughter of 19th century Spokane black pioneer and entrepreneur Peter Barrow. The Chases had a child Roland. During World War II, James Chase’s employment situation improved. He repaired military vehicles at Spokane’s Geiger Air Field and in 1945 partnered with Elmo Dalbert to open Chase and Dalbert Body and Fender, an automotive body repair shop. Throughout the 1950s and 1960s Chase served at different times as president and vice president of the Spokane Branch of the National Association for the Advancement of Colored People (NAACP). While at the helm of the branch, Chase brought Rosa Parks in as a guest speaker in 1956 and through the media he addressed local civil rights abuses in employment and housing. Chase’s political career began in 1969 when he lost his first bid for a seat on the City Council. He tried again in 1975 and was successful, becoming the city’s second black City Council member (D.K. Oliver served in the late 1890s). During his six years on the Council, he advocated transparency in city government, increased recreational facilities for children, and more social services for the elderly. In 1980 Chase entered the Spokane mayoral race. 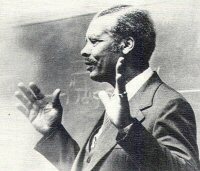 On November 3, 1981, at the conclusion of the controversial and bitter campaign against Wayne E. Guthrie, Chase garnered 60.52 per cent of the vote to become the first African American mayor of Spokane. His remarkable victory occurred in a city with a black population of 1.5 per cent of the total population. During his tenure as mayor, Chase supported the “1% for Art” program which sponsored the display of artwork in city buildings. He also managed the city through tough economic times. Although the city experienced a fiscal crisis, his advocacy of children contributed to the creation of a youth commission and the passage of swimming pool bond. With his popularity at an all time high, he announced in 1985 that he would seek re-election. Following Chase’s tenure as mayor, doctors diagnosed him with cancer. At the age of 73, Chase succumbed to his illness on May 19, 1987. Because of his overwhelming popularity, hundreds of people attended his funeral at St. John’s Episcopal Cathedral. For his life’s work in Spokane, City officials named the main art gallery in City Hall after him and Spokane School District 81 named a middle school in his honor. Chris Peck, “Jim Chase: He's Ready; Is Spokane?” Spokesman Review, October 29, 1981; Dorothy Powers, “Jim and Eleanor Chase Gave Spokane a Great 2-for-1 Bargain," Spokesman Review, November 17, 1985; Aldore Collier, “The Mayor Few People Know,” Ebony, August 1984: 122-126; “Statement of Votes Cast, 1981,” Spokane County Auditor, Elections Division. Held by Washington State Archives, Eastern Region Archives; Quintard Taylor, Interview with James and Eleanor (Barrow) Chase, 2 November 1972. Black Oral History Interviews, 1972-1974. Held in the Washington State University Libraries – Manuscripts, Archives, and Special Collections. See also: http://www.wsulibs.wsu.edu/holland/masc/xblackoralhistory.html; http://www.historylink.org/index.cfm?displaypage=output.cfm&file_id=8788.